Clerestory window, detailed square columns, and French doors lend drama to the arched and gabled grand entry of this stately home. Inside, luxury abounds with a formal living room with fireplace and box bay window as well as a formal dining room. Open to the kitchen and breakfast bay, the two story family room boasts a fireplace with built-in cabinets on either side. The master suite includes a lovely bay window sitting area. 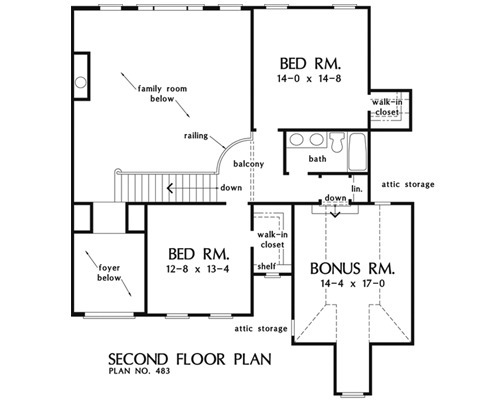 Upstairs you'll find two generous bedrooms with walk-in closets, a full bath, and bonus room. 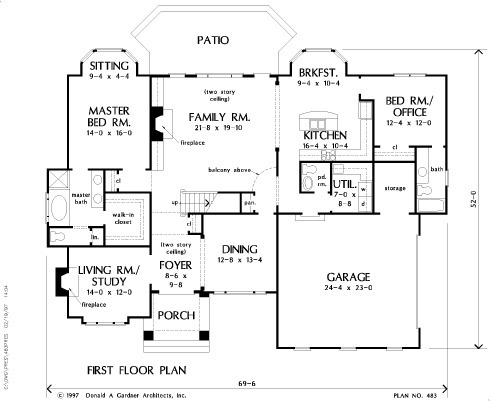 Additionally, this plan offers a convenient second master suite on the first floor for guests, the nanny, or a live-in parent. 1st Floor: 2249 Sq. Ft. Bonus Room: 308 Sq. 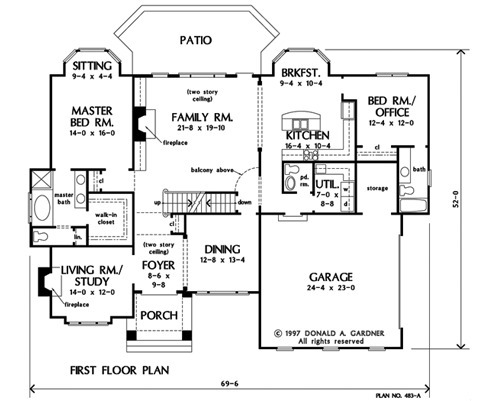 Ft.
House Dimensions: 69' 6" x 52' 0"
Great Room: 21' 8" x 19' 10"
Bedroom #2 : 12' 8" x 13' 4" x 9' 0"
Bedroom #3 : 14' 0" x 14' 8" x 9' 0"
Porch - Front : 11' 9" x 8' 4" x 0' 0"
Deck / Patio : 22' 4" x 11' 0" x 0' 0"
Balcony : 8' 2" x 8' 8" x 9' 0"
Foyer (2 Story): 8' 6" x 9' 8" x 19' 0"
Dining Room : 12' 8" x 13' 4" x 9' 0"
Great Room (2 Story): 21' 8" x 19' 10" x 19' 0"
Utility Room : 7' 0" x 8' 8" x 9' 0"
Bonus Room (Vaulted): 14' 4" x 17' 0" x 9' 0"
Garage Storage : 7' 0" x 8' 8" x 0' 0"